So whether we choose to acknowledge it or not, Fall is on its way… so instead of focusing on the fact that Fall leads to Winter, I think we should focus on something more exciting – new fashion collections!! So as we speak our favourite dressage brands are shipping their new collections to stores and I think my favourite thing about this year’s collections are the colours! Vibrant rich colours are in at the moment… burgundy, teal, blue and mustard are perfect choices for riding apparel as they can stand their own against horse slobber and dust. Some of my favourite features of the 2013 Autumn/Winter collections are the flattering fits of the tops and vibrant colours for breeches. Just because it’s cold outside, doesn’t mean we should have to dress like black and grey marshmallows to stay warm (a certain friend from Barbados knows exactly what I mean…). Here are some of my top picks from Pikeur, Cavallo and Gersemi. Please click on an image to view the large size. Ladies Outerwear: Keep warm with this seasons rich colours, down fill and fleece. My fall Fall riding apparel staples are a fleece or softshell with a vest. I love this parka in the red, tapered at the waist, covers your tush and has big pcokets for sugar cubes! 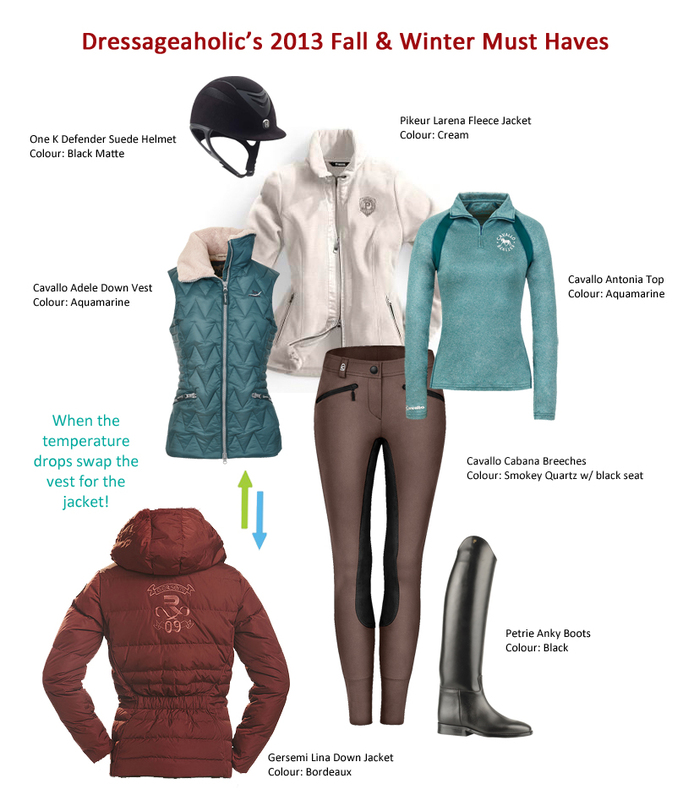 Ladies Apparel: I love Fall clothes, they’re warm with rich textures and provide options for layering – this season’s riding apparel is no exception. This high collar functional shirt, looks good and is moisture wicking (I hate sweating)! The high collar is great for keeping your neck warm in cooler weather and can be folded down like a polo on warmer days. I love the put-together look of 1/4 zip shirts in the saddle and this delivers both warmth and fun colours. This top comes in a “high tec” fabric that keeps you warm, dry and is lightweight. The material also stretches with you so you don’t feel constricted when riding, tacking up or working around the barn. This varsity style shirt fits right in on campus or at the barn. It’s also moisture wicking which is great for staying warm and dry during training sessions. This warm pullover is perfect for throwing over a polo shirt on a brisk morning incase it warms up later. The popular Pikeur Lugana breech comes in a softshell for the winter. This version keeps you warm by blocking the wind and keeping the warmth in. Mens Wear: We can’t forget about the guys, they need to keep warm too! I love the contrast of the grey/black with the trim details. This zip up will look great in and out of the barn and can be layered for more warmth. For the Horses: Our four legged friends need to stay warm too, here’s a preview of the fall collections to keep them happy throughout Fall & Winter. While it was hard to make a decision here are my must have pieces put together with my current helmet and boots. Thank you to the manufacturers who shared their collections with me. You can find more information at Cavallo.info, Gersemi.se and Pikeur.net. ← The Big Debate: Which colour of tall boots?